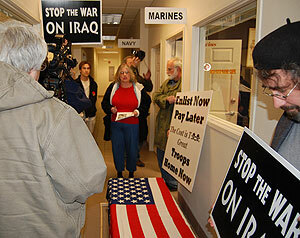 A few protests have been held in Iowa today to mark the fifth anniversary of the start of the war in Iraq. In Des Moines, 11 protesters carried an empty, flag-draped coffin to the entrance of the Armed Forces Career Center and forced the recruiting office to shut down for about 40 minutes. A 61-year-old and a 25-year-old, both part of the Des Moines Catholic Workers, were arrested after police asked the group to disperse and the two men remained behind. In Iowa City, protesters are holding an 18-hour peace vigil on the University of Iowa campus. John Paul Hornbeck of Iowa City is among the protesters. "Our foreign policy still hasn’t changed and they’re using the same rhetoric that we did when we invaded because I heard Bush’s statement at the Pentagon this morning," he says. "I was very, very disappointed and furious that there’s still people kind of applauding that stuff. I mean, it’s old material."